The New York Islanders have signed 27-year old goaltender Joey MacDonald to a two-year contract. The 27 year-old MacDonald will fill the spot with the Bridgeport Sound Tigers (AHL) vacated by the Islanders signing of Wade Dubielewicz, who is expected to share the nets with Rick DiPietro for the upcoming season. MacDonald spent last season in the Detroit Red Wings organization prior to joining the Boston Bruins. In seven appearances with the Bruins last year, MacDonald finished with a 2-2-1 record and a 2.68 goals against average with a .918 save percentage. "Joey MacDonald is an excellent young goaltender who fills a major need for us as a No. 1 for our AHL team in Bridgeport and adds depth for us in goal at the NHL level," said Islanders general manager Garth Snow. "Our staff is very confident Joey's best hockey is ahead of him." The 6-1, 195-pound MacDonald has played his entire American Hockey League career so far with the Grand Rapids Griffins, appearing in 164 games, posting a record of 88-57-7. 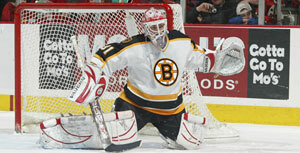 In 2003-04 MacDonald had a 1.97 GAA and .936 save percentage to go with a record of 22-12-3. The following season the Nova Scotia native was 34-29-2 with a 2.29 GAA and .926 save percentage. MacDonald made his NHL debut with the Detroit Red Wings last season and finished the year with the Bruins with a combined record of 3-7-2. "I am thrilled about this opportunity the Islanders have given me," MacDonald said. "Filling the crease that Wade Dubielewicz occupied for the past few seasons is going to be a tough job but I look forward to entering training camp and battling for the position."